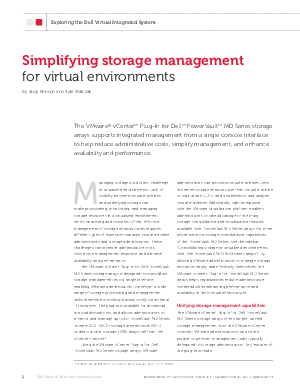 Managing storage is a distinct challenge in virtualized environments. Lack of visibility between virtual machines and underlying storage can make provisioning, monitoring, and managing storage resources in a virtualized environment time-consuming and complex. Often, effective management of storage infrastructures requires different types of expertise-separate virtual machine administrators and storage administrators. These challenges can increase administrative costs, slow down management response, and diminish availability and performance. The VMware® vCenter Plug-In for Dell PowerVault MD Series storage arrays is designed to consolidate storage management into a single interface, enabling VMware administrators to perform a wide range of storage provisioning and management tasks themselves-without having to rely on external IT resources. The plug-in is available for download at no additional cost, and allows administrators to monitor and manage up to 10 PowerVault MD Series Internet SCSI (iSCSI) storage area network (SAN) or direct attach storage (DAS) arrays-all from the vCenter console.